Zoho SalesInbox is an email client designed exclusively to help salespeople stay on top of the most important clients and deals. Users can get their email and sales activities prioritized automatically according to their sales pipeline and deal stages. The platform intelligently organizes leads by columns and folders, and enables advanced CRM filters that help users find emails fast. Zoho SalesInbox lets users perform CRM activities right from their email inbox and automates lead conversion processes. Users can set advanced rules or simply drag and drop emails to convert contacts into leads and deals. The user’s emails are kept in sync with their existing CRM system, and auto-suggestion features reduce contact search time. Before hitting send on an email, Zoho SalesInbox provides its users with contextual contact information including basic info, deal summaries, notes, and the contact’s entire history with the organization via timeline view. Companies can quickly bring new hires up to speed and prevent any disruptions to sales processes due to employee turnover or role changes. Zoho SalesInbox enables users to sell in real time with automated alerts and notifications for follow-up tasks. Email workflow tasks can be saved and associated to specific clients, while ‘ResponseWatch’ notifies users when a client fails to respond within a certain timeframe. The solution helps salespeople make the perfect pitch with personalized templates and email insights that tell which leads are listening. Software by Zoho Corporation Pvt. Ltd. I love it and I will definitely keep using it. I love how it tracks email opens. How I can schedule when emails are to be sent and that I can have the email thread. I do not like that the SalesInbox program opens a completely separate window when you have to send an email. Contact Zoho for detailed pricing information. Zoho SalesInbox cleverly organizes users' emails into columns, according to the way they have setup their CRM. Users can search and filter leads by CRM criteria from deal size, closing date, or source, and apply email labels for more fine-grained searches. Zoho SalesInbox enables users to automate lead conversion processes by setting rules or using drag and drop to create leads, contacts, and deals. Prevent emails from going unanswered by scheduling automatic follow-up calls and events, with alerts and notifications for the conversations that matter most. Zoho SalesInbox provides users with appropriate contextual information and a detailed contact history to help them craft the right message to customers. Below are some frequently asked questions for Zoho SalesInbox. Q. What type of pricing plans does Zoho SalesInbox offer? Q. Who are the typical users of Zoho SalesInbox? Q. What languages does Zoho SalesInbox support? Q. Does Zoho SalesInbox support mobile devices? Q. Does Zoho SalesInbox offer an API? No, Zoho SalesInbox does not have an API available. Q. 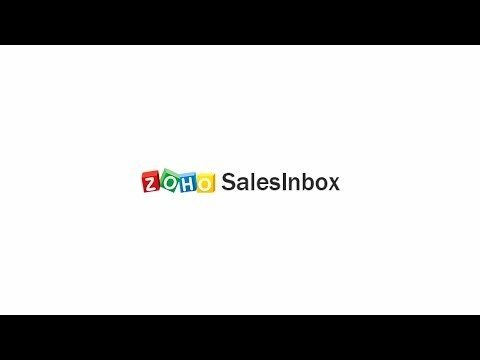 What other apps does Zoho SalesInbox integrate with? Q. What level of support does Zoho SalesInbox offer?